With two campuses in Newark and Camden, New Jersey, the unified Rutgers Law School is located in among the richest legal markets in the nation. New Jersey is one of the ten largest legal markets in the nation, and nearby Philadelphia and New York are two of the five largest markets. This provides law students with myriad educational and professional opportunities and real-world experience to help them thrive as practicing lawyers. Rutgers Law recognizes the evolving legal landscape and works diligently to revolutionize legal education to not only adapt to changing needs, but to create innovative solutions for equipping law students for the future of their profession. Since July 2016, Michael T. Cahill has served as co-dean and Professor of Law at Rutgers Law School. Prior to coming to Rutgers Law, Dean Cahill served as tenured faculty member, associate dean for academic affairs, and vice-dean of Brooklyn Law School. He has also taught as a visiting assistant professor of law at Chicago-Kent College of Law. Dean Cahill's primary focus is criminal law, and he has published three books and numerous scholarly articles pertaining to criminal law as well as health law and policy. He is the latest in our series of interviews with law school deans to take the time to answer our questions about legal education and the legal profession, and the changes, opportunities, and challenges facing prospective and current lawyers. Obviously the work of law school presents its own immediate challenges, but in terms of their long-range goals, law students face (and have always faced) two major challenges: (1) figuring out what they want to do with their careers; and (2) getting themselves into a position to do that. I think law school is often described, or assessed, in terms of its ability to help students deal with the second of those challenges — to help them get the tools, skills, opportunities, network of contacts, etc., that will enable them to pursue the careers they want. But law school also plays, or should play, an important role in helping students address the first challenge, without doing which they can’t properly address the second one. Many incoming students don’t know what they truly want to do in their professional lives (or, perhaps worse, think they know, but don’t have an accurate understanding of the job or practice area they think they want). One critical function of legal education is to help students learn about the vast array of things one can do in legal practice and determine which of those things is a genuine and meaningful fit for their talents and goals. I think there are multiple categories here: there are some challenges the school faces, and there are some that I personally face in trying to fulfill my role with all of my own limitations. As with just about every law school at the moment, my school’s biggest challenge is to offer an education that is affordable enough to attract well-qualified students and launch them into successful and happy careers that are not overly burdened by debt, while also ensuring the institution has sufficient resources to sustain its academic mission. Yet while that challenge is large and ongoing, I’m pleased and proud to have joined a public law school, supported by a strong university, that in my view is second to none in its commitment to pursuing both affordability and excellence. My own biggest challenge is to avoid prioritizing the tasks of the moment over the momentous tasks. One can spend one’s entire day (and I sometimes do) reacting to small matters, rather than planning for the future or focusing on the big picture. I think I’m particularly subject to this temptation because I hate letting things pile up, either on my desk or in my inbox. So I’m constantly responding to little things as a way of reducing clutter, when I should be finding time to attend to more long-range or substantial issues. If I only knew! Perhaps this isn’t a direct answer, because it cuts across practice areas, but I think an important part of the future of professional life, and of legal education, is what I call “law for non–lawyers.” In various domains — finance, health, energy, education, you name it — the impact of complex legal and regulatory rules is such that just about any white-collar professional will need some understanding of them to survive, much less succeed. At the same time, fewer people are becoming lawyers (for the moment, at any rate), and clients are increasingly reluctant to rely on lawyers as much as they once did. Accordingly, I think that more people across a range of economic sectors will want or need to acquire some degree of legal expertise, even though they don’t plan on practicing law; and as a result, law schools will increasingly offer non-J.D. educational opportunities that provide such expertise. As one example, I went to law school at the dawn of the laptop age. I don’t recall anybody having a laptop in class my first year; by my final year, I was bringing one myself, and so were a number of others. Now everybody has one. Laptops, PowerPoint, and various other innovations unrelated to legal education itself have changed the classroom experience, even where the substantive content of a course is the same. So teaching has changed in some ways. There have also been changes in what is taught, most notably with the expansion of clinical, externship, and other skills-oriented curricular opportunities. But on the whole, probably much more is the same than different in terms of what constitutes good teaching, and good learning. That impact is already profound and pervasive, of course. Beyond the obvious impact of things like DNA and other scientific evidence in the courtroom, numerous types of recording and surveillance technology are having, and will continue to have, a significant impact on law enforcement (and other aspects of our lives): body cameras for police; video capture on smartphones of police-citizen encounters; videotaped confessions; private surveillance cameras; data capture of various kinds by public and private entities; and so on. The evidence (and legal issues) generated by this technology will create significant opportunities and challenges for both defense and prosecution. I hesitate to answer, because I’m hardly a SCOTUS expert. But as a general matter I would say that the many issues the Court confronts with respect to the institutional structure of the modern administrative state are no less thorny and complex, and often just as consequential, as issues relating to the constitutional rights of individuals. I can’t squarely answer this question, as I never exactly practiced law, though I was involved as an advisor and/or administrator for a couple of law-reform efforts. But in any case, the answer is no. 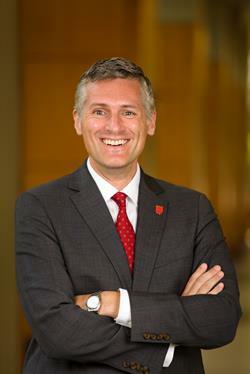 My job is as stimulating and rewarding as I could possibly desire, and I get far more satisfaction from playing a role in preparing many others for the practice of law — and supporting the impactful scholarship, clinical practice, and civic engagement of our students and faculty — than I would from any modest contribution I would make in practice myself. Abraham Lincoln and Barack Obama are two lawyer-politicians I imagine would have a lot of interesting things to say to (or ask) each other, about law and a great many other subjects, if they were brought together. I’d love to listen. Someone like Thurgood Marshall or Pauli Murray would be a great third participant in that conversation. There are many. When I was much younger, in the days of VCRs, I watched and re-watched “Judgment at Nuremberg” and “Twelve Angry Men” on tape. I have a soft spot for “The Verdict,” in part because I’m a big fan of Paul Newman. Among more recent movies, I thought “Michael Clayton” was an interesting take on the legal drama, and on legal practice. If I were recommending something for others to see, I think that by far the most underappreciated, or insufficiently well-known, legal drama is the Australian film “Breaker Morant,” which is outstanding.